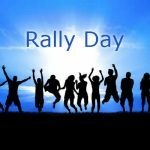 Rally Day 2016 is Sunday September 11 at 9:30AM! Following worship we will have our annual picnic at the Ranch House in North Park. Invite family and friends to join us. Side dishes, desserts or drinks would be appreciated. No cost. Directions: Take McKnight Road to the North Park exit (Yellow Belt) and continue on Ingomar Road. Turn left onto Kummer Road. The Ranch House will be on the left. ← A New Life: Be Encouraged. Be Inspired.